Republican presidential candidate says he will hold back funds to the UN if it tries to impose a peace agreement on Israel. Senator Lindsey Graham (R-SC) on Wednesday promised to respond with a “violent pushback” if the United Nations attempts to force a resolution to the conflict with the Palestinian Authority on Israel. 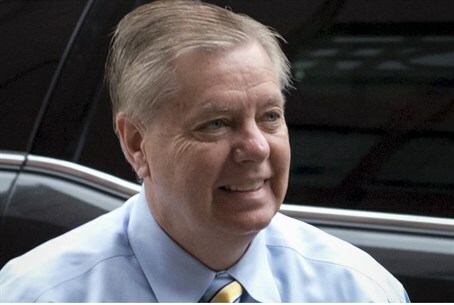 Graham, who is expected to officially announce that he will be running for president on June 1, was speaking at a press conference in Jerusalem after meeting with Prime Minister Binyamin Netanyahu. Ask how he planned to act against the UN if any of the initiatives to set a deadline for a peace agreement were passed, Graham said he would withdraw funding to the body. “I am in charge of the foreign assistance account, I’m in charge of the money we provide for the United Nations,” he said, according to Haaretz, in reference to his chairmanship of an appropriations subcommittee. The UN’s envoy to the Middle East, Nickolay Mladenov, said last week that the global body would explore options with Israel's new government for a return to negotiations on creating a Palestinian state within a reasonable timeframe. Mladenov said he and UN Secretary-General Ban Ki-moon "will be engaging the new government to explore realistic options for a return to meaningful negotiations towards a two-state solution within a reasonable timeframe." Ban said recently that after a new Israeli government has been sworn in, he will investigate whether there are "realistic options" for a return to peace talks between Israel and the PA.
New Zealand recently indicated it is working on the new resolution to revive the long-stalled peace talks. The move from New Zealand, which was elected as one of the 10 non-permanent members of the UN Security Council, reflected growing impatience within the council over the failure to agree on a UN approach for the Israeli-Palestinian peace process.